A Wedding Story: It all ends in a party. Remember that serious ceremony stuff? Well now it is time for a PARTY. Throw the type of party you would want to attend. Be inspired… but be realistic. After grand visions of barns draped in silk garlands and lighted by candelabras that were, of course, vintage — my mom and I realized there is a reason so many people just opt for mason jars. Draped barn was replaced with public park gazebo (remember it from here?) and no candles were in sight, not that they were missed. Because you know what, so many details will not be noticed by anyone. So have fun decorating, but don’t get too carried away. Do however, go through your house finding all the old stuff you can repurpose as “vintage decor.” Because my mother had all sorts of crazy stuff saved, and knew some guy who would cut us all those wood rounds, we paid for very few decorations. Yes, my daughter will someday scorn our generation’s taste and opt for the poofy bows and tulle draped columns of our foremothers. Before you use an entire car-full of baby’s breath, check to see if your finacé is extremely allergic to said flower. If it is too late for that, keep lots of allergy meds on hand. Feed the people well, it gives them more energy to dance like idiots. If you can find a man whose mother makes a cake with a buttercream frosting so sinful that it dissolves if you look at it too hard, you should probably marry him so that his mom will make your wedding cakes. If your parents have secret dance moves never before shared with the world, like the “ham-bone,” find out and then form dancing circles around them whenever possible to encourage them to break them out. Relish the fact that after all the work, after all the planning, after all the pressure, and after all the money, you are married and have succeeded in having everyone you love, have loved, or will come to love, under one roof dancing the cupid shuffle. Enjoy it. What’s that you say— are those snocones?????? Why yes. We had a couple loved ones with severe dietary restrictions, and let’s be honest — who doesn’t want a snocone in the middle of July? My friend Jeremy’s parents happened to own all the snocone stuff and they came and ran the booth the whole evening, which meant that my wedding and the 18th birthday party I threw for my friends in high school were on par with each other. And in looking through our photos, James and I were happy to see that our snocones were enjoyed by a number of people just passing through the park, having no connection to our wedding. Also, those colorful mints above were handmade by my granny…. all 700 of them. Yes, James and I did the awkward middle school sway, but only because we realized that these might be the only moments we could talk uninterrupted. Dad and I however, broke out a super classy foxtrot, which had been carefully practiced while wearing my old prom dress for weeks before. Enough of the classy dancing — now on to the crazy dance fest that was the rest of the reception. And so the night ended with those awesome ribbon sticks making their way onto the dance floor and everyone dancing until we were all disgustingly sweaty. I wouldn’t have had it any other way. Most importantly, it ended with me leaving as James’ wife, and that, I certainly wouldn’t have had any other way. All photos by Whitney Neal Photography. 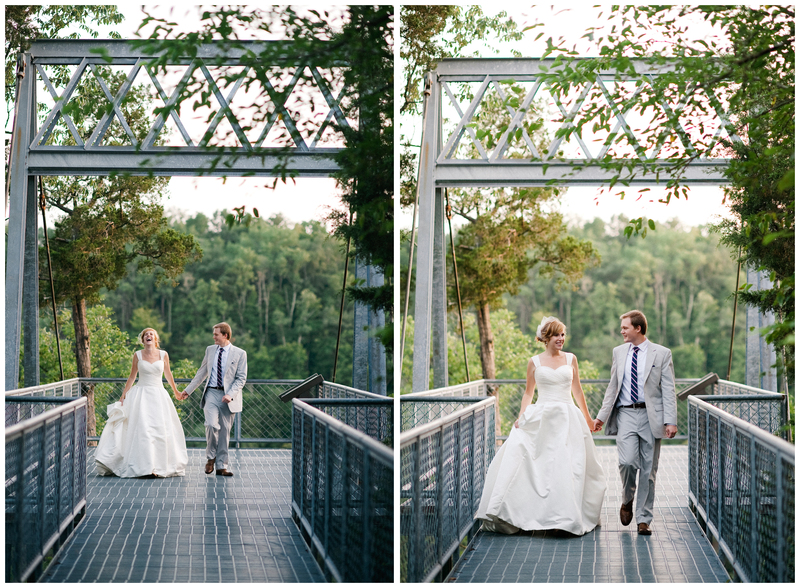 This entry was posted in Uncategorized and tagged colors, dancing, family, flowers, friends, High Bridge park, kentucky, photography, reception, wedding, wilmore. Bookmark the permalink. 9 Responses to A Wedding Story: It all ends in a party. I wish to lodge a formal complaint that in all of the wedding photos, there is not a single picture of me and Ruth. Due to this, I suggest you need to do it all again, in order to fix the problem. I have already begun collecting warm clothing to get me through the night on the courthouse steps to book the spot. I think there might be some of you both…. somewhere. annnddddd you two are dancing in the background of two of the above photos…. does that count? Background dancing does not count. And we did run up to the photographer for pictures. And she took some. And somebody had a video camera pointed at us when we were dancing at one point. Or maybe this is the universe getting back at you for avoiding all pictures for so long. Beautiful photos! Your photographers really captured FUN in these pics! I’ve enjoyed every one of your wedding posts, and you thoroughly convinced me that a “first look” is a good idea. Never thought I’d think it, but I wish we had done that for our wedding!